Dr. Lori Arviso Alvord, who is an associate dean at Central Michigan University in Mount Pleasant, Mich., signs her book "The Scalpel and the Silver Bear" Friday at the UNM-Gallup branch in Gallup. As Linda Curtis clutched her copy of "The Scalpel and the Silver Bear," the 1999 autobiography by Dr. Lori Arviso Alvord, she spoke about meeting the doctor. Alvord was the first Navajo woman to be board certified in surgery in 1994 and was making a presentation Oct. 21 to University of New Mexico-Gallup students. "Very, very inspiring, she's incredible," Curtis said. "It's good for the Navajo people, especially for the youth." That inspiration is one reason Curtis had her niece read the book. Her niece is now completing her fourth year at Northwest Missouri State University in Maryville, Mo. Alvord was here to discuss her book, which she co-wrote with Elizabeth Cohen Van Pelt, since it was selected as the 2011 Lobo Reading Experience book and to talk about her career. 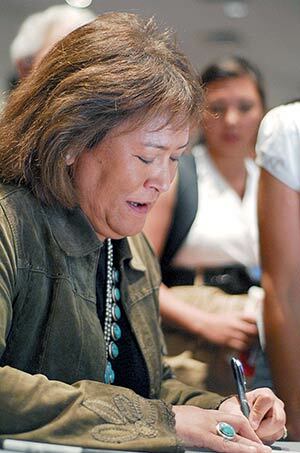 A day earlier, she spoke to students at UNM's main branch in Albuquerque. With the majority of the audience comprised of UNM-G students, Alvord said to them that her college study was not as easy as it seemed. "I want you to know it was not nearly as smooth as it sounds getting through college," she said. "I had trouble my first couple of science courses." Some audience members looked surprised by Alvord's statement while others appeared relieved. Alvord said she was a straight-A student at Crownpoint High but when she was an undergraduate at Dartmouth College, she received her first D in calculus and a C- in chemistry. Both grades made her think that she was not smart enough to major in science. But what she did not understand at the time was that she was not adequately prepared like her classmates who had completed college preparatory classes during high school. So she moved from the natural science field into psychology, sociology and Native American studies. "I fell in love with the brain and the mind," she said. After graduating from Dartmouth, she was working as a research assistant at the Veteran's Administration clinic in Albuquerque. The doctor who ran the lab suggested medical school to Alvord, which caused her to blush because she remembered the low grades from her undergraduate studies but the doctor continued to encourage her. So she started with some easy pre-medical courses but challenged herself by taking a physics course one summer at UNM. She said she was lucky to have a physics instructor who explained the methodology in a way that she understood. "My god, that guy was a really good teacher and I got through that with a B," she said. Then she paused to offer advice to students who might be having difficultly completing their college courses. "Some of the key things are, if you don't understand is that sometimes it's not you, sometimes it's your teachers," she said. "Your teachers, sometimes you have to go back to them and say, 'Teach it to me in a different way, show me a different way so I can understand it.'" Through her schooling, Alvord learned that Native Americans are visual learners and she began to alternate the way she learned with a focus on the challenging science courses, although she found herself catching on to organic chemistry and human anatomy because both are more visual. "Like I said, I didn't do well my first time. This is to say to you don't give up if you don't get it right the first time, come back around, don't be afraid," she said. She applied for medical school at UNM and Sanford University. Alvord graduated from Sanford's medical school in 1990. After medical school came the national board examination for her licensure. She said there are three portions to the examination and she did not pass on the first and second attempts but did so on the third. "These are just encouraging words to you, you can fail once and you can even fail twice but you can still get to where you want to go if you really want to do it," she said. Alvord returned to the Southwest and practiced general surgery at Gallup Indian Medical Center for six years before helping physicians in training and working with traditional medicine, an interest that was sparked by working with Zuni and Navajo patients. She continues to help physicians understand the intersections between Western and traditional medicine. From 1997 to 2009, she was the associate dean of student and multicultural affairs for Dartmouth Medical School. She is now an associate dean of student affairs at the College of Medicine at Central Michigan University in Mount Pleasant, Mich.
Over the past year, Alvord has spoken to students at Navajo Preparatory School, Pine Hill, N.M., and Arizona State University. Alvord is bilagaana, born for Ashiihi dine'e (Salt People clan). Her nali is Tsi'naajinii (Black Streak Wood People clan). After Alvord's presentation, Carleen Alexius was one of the many people who asked Alvord to sign her book. Alexius is a nursing student at UNM-G and would like to become a nurse anesthetist. "It was nice to see her in person," Alexius said. "I never thought I would meet her or speak to her."